As one of or arguably the WWE’s biggest ever signing, Ronda Rousey is also making her name known in Hollywood. Ronda Rousey has already made small appearances in Hollywood Blockbuster movies such as: The Expendables 3, Fast & Furious 7 and Entourage. Even now as we speak, she is set to star in the upcoming action thriller movie, Mile 22. However, her biggest potential role is yet to come as she has been announced for the lead role in the 1989 remake of Road House, casting as Dalton, who was played by Patrick Swayze in the original film. When the signature sound of shattering glass erupted throughout the arena, everybody there knew that it was time to raise hell. “Stone Cold” Steve Austin first made his on-screen film debut in 2005 when he acted as Guard Dunham, a guard who loved harassing inmates in the film, The Longest Yard. Over the next couple of years, Austin would appear in many “low-budget” films such as: Recoil, Damage, Hunt to Kill, Born to Fight, Tactical Force and Deadly Target. One of his more noteworthy films on the other hand was his performance in The Condemned. He also made an appearance in The Expendables as Dan Paine, co-starred with Steven Seagal in Maximum Conviction and even played as Adam Sandler’s high school bully in Grown Ups 2. John Cena made his debut in Hollywood when he acted in his first movie produced by WWE Studios, The Marine. He would then go on to star in his second film again produced by WWE studios called 12 Rounds and co-starred in his third film produced by (you guessed it) WWE Studios, titled Legendary. His first movie outside of “WWE Studios” was in the children’s film, Fred: The Movie, where he played Fred’s imaginary father. More recently, John Cena has been involved in bigger projects such as: Ferdinand, Daddy’s Home 2 and Blockers. He is also set to star as the lead role in the Transformers spin-off prequel, Bumblebee: The Movie. “The Animal” Batista is another name that has recently made it big in Hollywood. 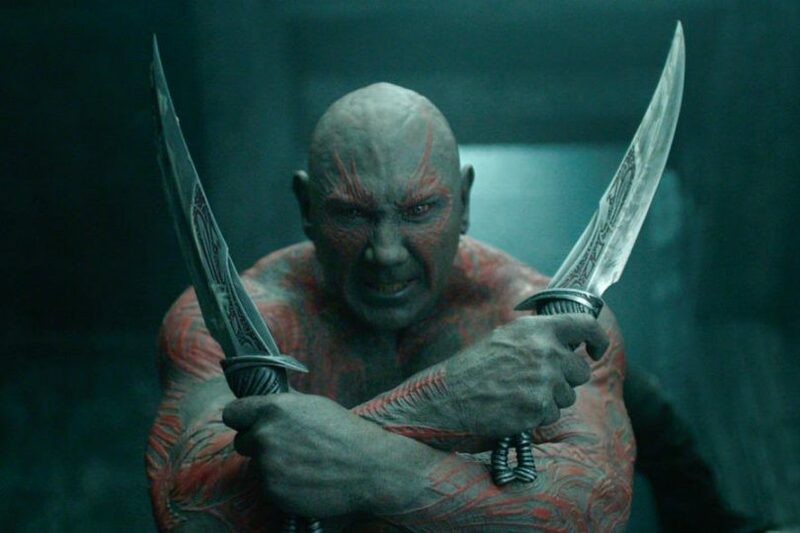 His major acting breakthrough to cement his place in Hollywood came from his role as Drax the Destroyer in Marvel’s Guardians of the Galaxy. He has played the role of Drax in Guardians of the Galaxy, Guardians of the Galaxy: Vol. 2 and Avengers: Infinity War. Batista was also highly praised for his acting role in Spectre (even though he had just one line in the film), in the 25th instalment of the James Bond franchise, which saw him cast as Hinx. He was involved in a very intense and well-choreographed fight scene with Daniel Craig who casted as James Bond, which was a pleasure to watch! Other notable film mentions Batista has been involved in is: Riddick and Blade Runner 2049. When you think of a WWE wrestler who is extremely successful in Hollywood, Dwayne “The Rock” Johnson is one who probably springs to everyone’s mind. In fact, The Rock was the highest paid actor in the world in 2016, making $64.5 million and the second highest paid actor in the world in 2017, making $65 million. His first taste of the big screen came in 2002, when he starred as the lead actor in The Scorpion King, a prequel to The Mummy Returns. The Rock has appeared in many notable Hollywood Blockbuster movies such as: The Fast & Furious movies (from Fast & Furious 5 onwards…), Doom, San Andreas, Central Intelligence, Moana, Baywatch and Jumanji: Welcome to the Jungle. The Rock’s Hollywood career is by no means slowing down as he is set to take the lead role in DC Comic’s upcoming film Black Adam, a supervillain and occasional antihero. He is also announced to act in: Jumanji 2, Skyscraper, San Andreas 2 and Doc Savage as well as rumoured to star in Suicide Squad 2 as Black Adam.